In a coffee shop in Tehran, Yasmin* adjusts her scarlet-flowered headscarf and plucks a book from a nearby shelf. 'This one is called The Secrets about a Man that Every Woman Should Know,' she says. She removes a second tome and checks the title written on the book's jacket, back-to-front in Farsi style. 'What Women Want Men to Know,' she says, to rumbles of laughter from the group of (mostly) foreign women sitting at the table with her. Is the government okay with this, one of the women asks? Such enlightenment is at odds with my idea of post-revolution Iran, a repressive theocracy in which Islamic clerics preside over a society of shielded women and downcast men. Indeed, the revolution in 1979 transformed the country from an ancient Persian monarchy into an Islamic theocracy, one bristling with rules, dictates and enough plainclothes morality police to enforce them. It is true that such policemen exist; they will reproach a young woman for wearing a skirt that reveals her bare ankles, Yasmin tells me, complain that her scarf is too brightly coloured, or demand that she adequately cover her flyaway hair. Her father might be summoned to discipline her. "Much like their western counterparts, Iranian women are raising their voices against the gendered prejudice endured by them for decades." They will rebuke men, too, if they sport too many tattoos or are caught drinking, but it's really women who are expected to uphold the strict moral codes, to police their femininity lest it offend — or worse, arouse — the men in their midst. But much like their western counterparts, Iranian women are raising their voices against the gendered prejudice endured by them for decades. The month before I arrive in Tehran, during a wave of anti-government protests, a woman is photographed standing on a telephone box, her headscarf removed and draped on a stick. In prurient Iran, this is the equivalent of removing one's clothes. The woman, Vida Movahedi, is arrested and later released. Her act of defiance (which earns her the social media tag 'the girl from Enghelab Street') inspires others: throughout January, women — and men standing in solidarity with them — follow suit. Photographs of bare-headed protesters holding aloft their scarves pepper social media. Iranian Nobel Peace Prize laureate Shirin Ebadi calls these dissents 'the culmination of years of protests against the hijab'. Iranian women, who have long expressed discontent overtly and in quietly subversive ways, seize upon this widely reported protest to object to the sexist rules imposed on them. But there's something else powering this resistance: social media. The phenomenon often derided as self-limiting and regressive for women in the west is helping foment change for their Iranian counterparts. 'Instagram has changed everything,' Yasmin says as she flips through images of her younger sister, a pouting Kim Kardashian-lookalike with contoured face and flowing, uncovered hair. Though much of the internet is officially censored, Iranians are easily able to bypass controls, and the government turns a blind eye. Satellite television, meanwhile, brings the west right into people's living rooms, so that Iranian girls are growing up with the very role models their clerical leaders abhor. But it's not just this exposure to other ideologies that's driving social change. More than 75 per cent of university students are women, Bahar* tells me in a hotel lobby in Shiraz (women also comprise a staggering 70 per cent of science and engineering students, according to a 2015 article in Forbes). If the glass ceiling exists, then Iran's women are slamming their heads against it: they run their own start-ups, travel abroad alone, and hold political office (Laya Joneydi was a professor and law expert before she became vice president for legal affairs last year; however her acquiescence to the government's insistence she wear the chador in her new role has attracted criticism). As the arrest of 'the girl from Enghelab Street' illustrates, liberty and orthodoxy are still locked in battle. But the veil is slowly slipping, and soon it will disappear, Bahar predicts. 'It's not that far away, because society is changing,' she says. The red lips and bright clothes and tendrils spilling from headscarves are not just westernised symbols of female self-expression; they are signs that something revolutionary is simmering beneath the surface of this apparently obedient country. 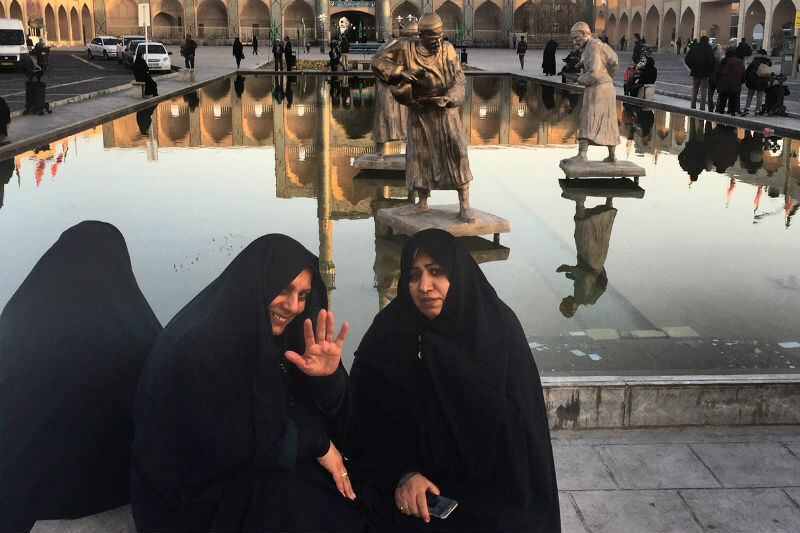 Catherine Marshall travelled to Iran with Intrepid. Photo of women in chadors by Catherine Marshall. Persian poetry, famous the world over through the works of Rumi, Hafiz, Kayyam, Ferdowsi and Sa'di, is one of the greatest literary legacies of humankind. And now other literary genres are emerging in Iran! Well done ladies.